Ed Sheeran's Divide was last year's biggest-selling album, shifting 2.7 million copies in the UK, but the star has no immediate plans to follow it up. "I'd like to bring out a project next year that isn't an album," he told BBC News. "Something that isn't pushed on radio. Something that's not what I usually do, that just clears the air a little bit." He added he'd "happily" take a year off when his world tour ends next September before starting his fourth album. The news may disappoint fans, but Sheeran pointed out that spending three years on tour was "weird" and he'd need time to decompress. The star previously took a "gap year" between his second record, Multiply, and its chart-conquering successor - time he spent whitewater rafting, swimming with bull sharks (without a cage) and bungee jumping. However, he admitted he had never stopped writing songs. "I'll never not make music. It's my hobby," he told the BBC's Chi Chi Izundu. "I wouldn't enjoy life if I didn't do music. "I don't see music as work. I see this [speaking to the press] as work. No-one picks up a guitar hoping one day they're going to be interviewed." The 27-year-old hinted his new music would be more experimental than the radio-friendly pop of Shape of You and Thinking Out Loud, namechecking his pre-fame EP No. 5 Collaborations Project, which featured UK rappers Wiley, Devlin, JME and Sway. "I would love to do something like that again," he said, calling the 2011 EP "the most interesting project I think I've ever made". He also said he would "love to do a musical" and follow up his cameo roles in Game of Thrones, Bridget Jones's Baby and Home & Away with a bigger acting role. "I'd like to make one movie. Just one," he said," and continue making albums and continue touring and hopefully have a family." 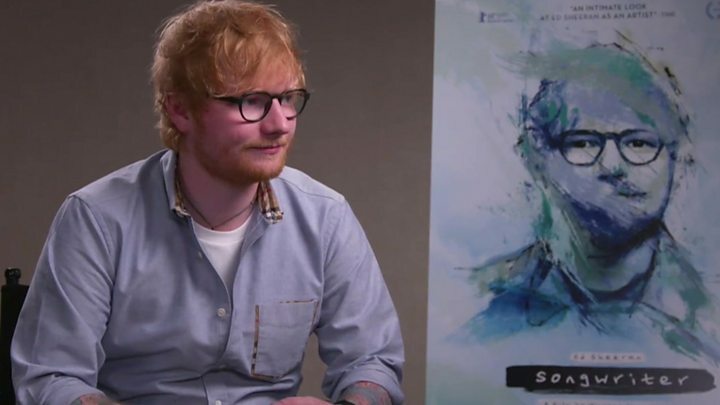 The star, who recently hinted that he has secretly married his childhood friend Cherry Seaborn, was speaking to the BBC ahead of the release of a new documentary, Songwriter, which follows his career over a 10-year period, leading up to the creation of Divide. Shot by Sheeran's cousin Murray Cummings, it includes never-before-seen videos from his childhood and fly-on-the-wall footage as he creates some of his biggest hits in the studio. "There's no juicy gossip in it," he joked. "It's just me writing songs." However, he said he hoped the intimate, revealing film would inspire other young songwriters. "I went to comprehensive school in Suffolk and lived in the middle of nowhere and ended up being here - and it's just through writing loads of songs and doing loads of gigs. And you can get to that. "I didn't start off being able to sing or play guitar. I had to learn to do both of them." In the documentary, he credits his music teacher at Thomas Mills High School, Richard Hanley, with encouraging him to pursue his dream. "There were a lot of teachers who didn't quite get it," he says. "Mr Hanley never had a doubt." That's why he's disappointed that lessons like art, drama and music are being squeezed by widespread budget cuts. "The thing that confuses me about it is that most of the wealthiest people in England, who stay in England and pay taxes, are musicians and artists. "You know, Paul McCartney, Damien Hirst... All these people who have, like, hundreds of millions stay in England and pay their taxes. And half the people that don't pay their taxes have nothing to do with music. "So what I don't understand is, if you're cutting art, drama and music from schools, that isn't going to happen any more and you're not going to have home-grown talent at all. "They've cut it in my local high school and I've kind of been able to get them back on their feet with it - but not every school has that. "The music industry in England has always been one of the most powerful things in the world and it just makes no sense that you'd take that off the school curriculum. I just don't understand it."